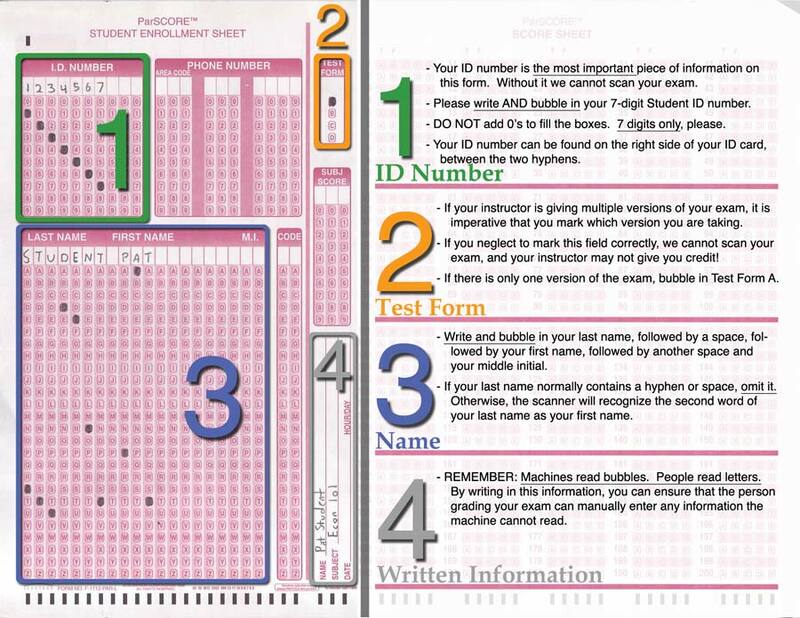 Information Technology Services provides a Scantron test scoring service to the UCSC campus. This service is fee-based and is available on a first-come, first-served basis. First time users of this service are encouraged to contact ITS in advance to review the process prior to a real test-scoring situation. Exams are administered using the Parscore f-1712 form for the student responses and the Answer Key(s) and submitted to ITS with a Scantron Request Form (available at Kerr Hall Room 149) and online at Download Scantron Job Request Form (PDF). IMPORTANT NOTE: ITS uses exclusively ParSCORE form number f-1712. The scanning/scoring software which ITS uses to score test forms will not work with any other forms. Please follow these instructions PRECISELY to use and submit ParSCORE forms for scoring. The ParSCORE forms are available at Bay Tree Bookstore. The purchase of the forms is at the instructor's discretion; the instructor may purchase them or ask the students to purchase them and bring them to the exam. Scantron utilizes an OMR (Optical Mark Reader) software program (Parscore) that generates a variety of statistical reports useful for both score tracking and analysis. These reports are available in .pdf, .xls and .txt formats, depending on the report, and are sent to the client via email. Roster by Last Name (PDF) - This report is sorted by the students' last names and shows their full name, ID number, numerical score and a letter grade assigned by the program based on the default setting of 10 percentage points per letter grade. A= 90-100, etc. Score Distribution (PDF) - This is actually two reports (see Score Histogram below). The Score Distribution report shows the average or "mean" score, the standard deviation from that average and the highest and lowest scores. In this report, the relationship of percentages to points is illustrated, which is helpful when deciding percentage cut-offs to use for grade criteria. Score Histogram (PDF) - The Score Histogram is a bar chart graphic representation of the Score Distribution Report. Scores are converted to a percentage (the horizontal axis) and the frequency(number of students) is plotted on the vertical axis. Item Analysis (PDF) - This is a statistical report that provides detailed distractor analysis based on raw scores. The reliability of a question, the difficulty, or effectiveness is statistically calculated. Useful statistics on each question include the percentage of students in the class who got it right, and the percentage of the students in the top and bottom thirds of the class who got it right. Answer Key (PDF) - This shows what the correct answer for each question is and the weight and penalty (if any) for each question .NOTE: If more than one test version (A, B, C or D) is used there is a separate Answer Key report for each version. Student Test (PDF) - This shows what each student answered on each question and the correct answer for any questions they got wrong. It is printed 1 or 2 students per page. Student Response (PDF) - This report is a comma delimited text file showing in order from left to right: Student ID number, test version, total raw score, response each student marked for each question, first name, middle intitial, last name and percent score. Excel (PDF) - This is a Comma Separated Value (CSV) excel file showing in order from left to right by column heading: Student ID number, last name, first name, middle initial, raw score and a letter grade that is based on the default grading criteria (A=90%, B=80%, C=70% etc...). Canvas (PDF) - This is a Comma Separated Value (CSV) excel file formatted to upload into the Canvas Gradebook, showing in order from left to right by column heading: Student Name, SIS User ID, Quiz1 (with a raw score). NOTE: The first score in the Quiz1 column is the total Points Possible. Student Enrollment (PDF) - This shows the complete student record for every student enrolled in the course. Error Log (PDF) - This report tracks all errors encountered in scanning score sheets, whether the errors are corrected at the time of processing or not. Grading Criteria (PDF) - This shows the grading criteria (A=90%, B=80%, C=70% etc...) used for scoring the exam. This information can be displayed in both "report" and "graph" formats. NOTE: Grading criteria can be adjusted to create a "curve."